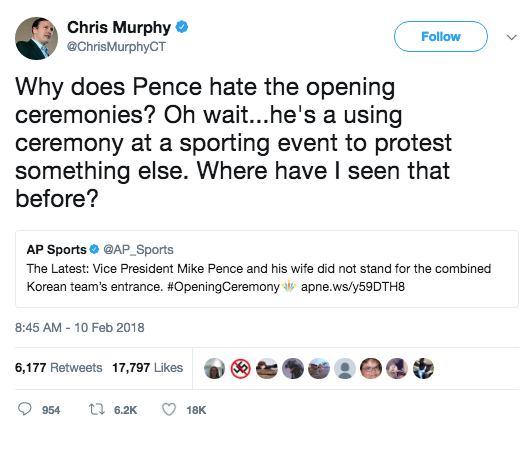 In a tweet on Saturday, Sen. Chris Murphy (D-CT) compared Vice President Mike Pence’s refusal to stand for the North Korean team’s entrance at the Olympics to NFL Players’ protests during the American national anthem. But there’s another problem with Murphy’s tweet: it wasn’t a protest. The Vice President’s press secretary pointed out on Twitter that leaders only stood to applaud their own countries, and Pence sat for every country except the United States.